Béla Lugosi (20 October 1882 – 16 August 1956) born in what is now Lugoj, Romania, was a Hungarian-American actor of the theatre and movies. 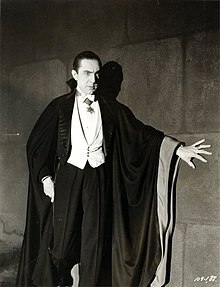 He is best known for playing Count Dracula in the Broadway play and the movie version. He was a character actor who played many different kinds of roles, but was most often seen in horror movies including White Zombie. He is one of the first actors to enter drug rehabilitation for a drug addiction. In the last years of his career he acted in several low-budget B-movies, some by director Ed Wood. He died in Los Angeles, California of a heart attack when he was 73 years old. Bela G. Lugosi is his son. This page was last changed on 25 October 2015, at 02:51.